Hamilton Beach Personal One-Cup Pod Brewer Just $9.99! Down From $29.99! 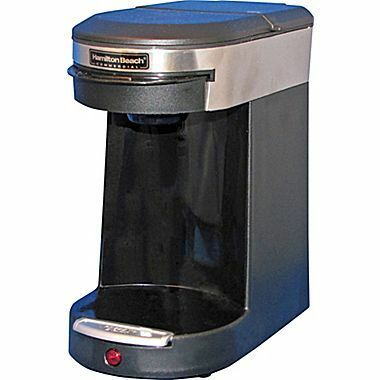 You are here: Home / Great Deals / Hamilton Beach Personal One-Cup Pod Brewer Just $9.99! Down From $29.99! Staples has this Hamilton Beach Personal One-Cup Pod Brewer on sale for $9.99 (Reg. $29.99) through 5/14! Plus you can get FREE in-store pickup or FREE shipping on orders over $14.99! Hamilton Beach® 12 oz Personal one-cup pod brewer measuring 9″ x 5.4″ x 9.4″ has front loading design that minimizes touching and improves sanitation. Brewer uses with standard 1 cup drip coffee and tea pods. 9″ H x 5.4″ W x 9.4″ D, 2.8 lbs.